We are manufacturing precision plastic injection moulded components for automotive sectors. By following the quality systems we are able to deliver these components as per the requirments of our customers. We have developed many Plastic Injection Moulded Parts for many engineering sectors. Most of the components we developed required close dimension tolerance and finish. We are having very good processing experience in all engineering polymers. Most of the components we are moulding are having high accuracy & high finish. We are moulding clear transparent components in Poly carbonate, Acrylic, Polystyrene & SAN. We are also moulding threaded components with auto unscrew moulds . All engineering polymers are injection moulded for various sectors. 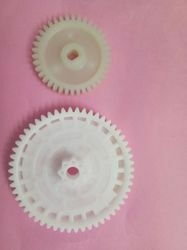 We are manufacturing plastic moulded gear wheels for automobile and machinery industry. We are expertised in precision plastic gear moulds and components. With high engineering polymers we are maintaining all requirments of our customers through our best quality systems.